Matrix metalloproteinases (MMPs) are secreted by macrophages, neutrophils and fibroblasts due to the stimulus from the transforming growth factor β (TGF-β) and interleukin-8 (IL-8). Hence, secreted MMPs maintain the bioavailability of growth factors, thus promoting cancer proliferation. It cleaves the FAS receptors and suppresses natural killer cells, resisting the apoptosis. It promotes and inhibits angiogenesis. In addition, it increases the bioavailability of vascular endothelial growth factor receptor (VEGFR) to cause neovascularization. Substances such as tumstatin, endostatin, angiostatin and endorepellin inhibit angiogenesis. MMPs action in the cell-to-cell adhesion and cell-to-extracellular matrix adhesion is responsible for the promotion of malignancy. The expression of MMP-9 has proved to be a diagnostic marker in oral cancer in the tissue,  serum  and saliva  samples in various studies. An overall incidence of cancer in Central Asia is at the rate of 100.8/100,000 in world. Oral cavity cancer claims 145,400 deaths in a year worldwide. The predisposing factors for oral cavity cancer include smoking and smokeless tobacco, alcohol and human papillomavirus infections. Oral carcinoma develops from oral potentially malignant disorders (OPMDs). Potentially malignant disorder, the term was proposed as all the conditions called to be so, does not transform into malignancy. The prevalence rate of oral lesions is 4.1% in South India. The rate of oral potential malignant disorder transforming to malignancy is 2%-3%. OPMDs are considered as the early tissue changes due to various habits such as smoking and chewing tobacco. There are several studies that have been done in the relationship of MMPs to cancer invasion, progression, apoptosis, migration and neovascularization in cancer. MMP-9 is an inducible enzyme, unlike MMP-1 and MMP-2 which are constitutive enzymes. Hence, its levels would be altered during the changes in the tissues. The rationale of the review is to know the expression of MMP-9 in OPMD. 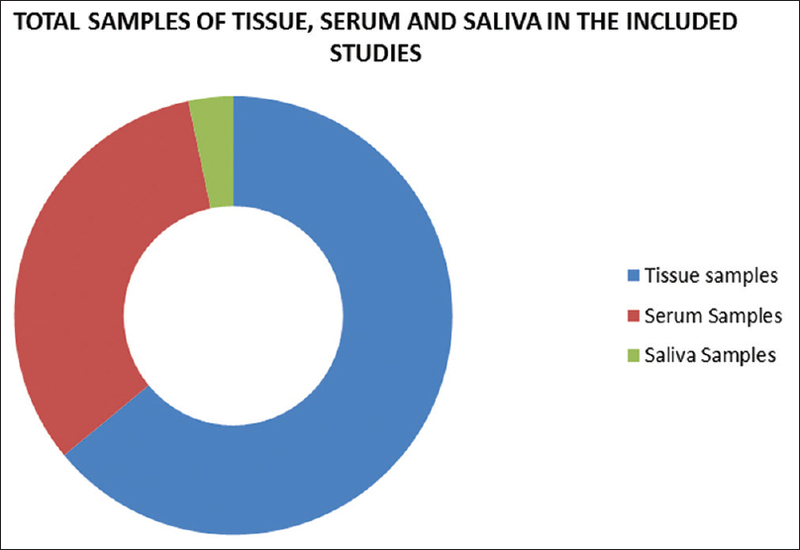 To know which of these that is tissue, saliva or serum is the most reliable means of detecting the expression of MMP-9. 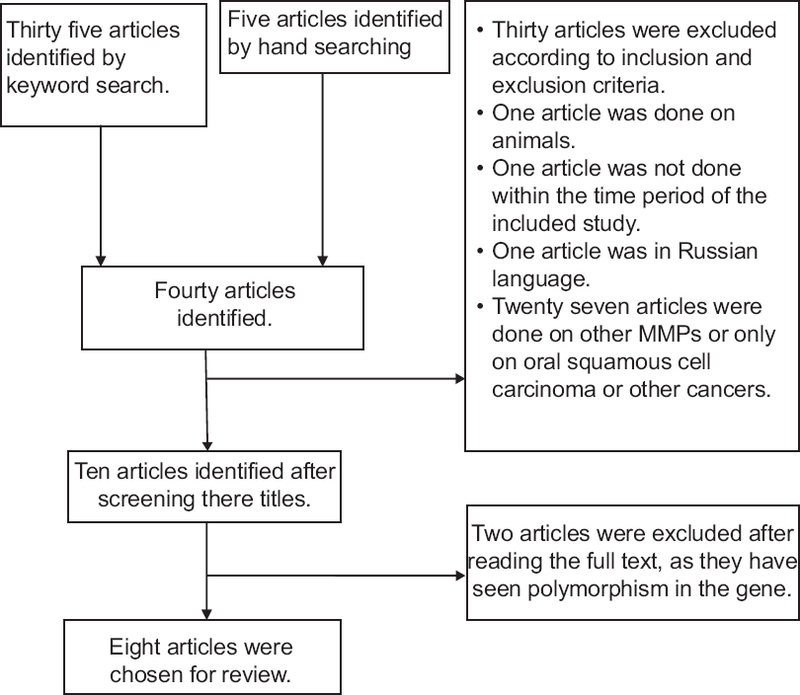 Various databases such as PubMed and ScienceDirect were searched using the key words of OPMD, oral leukoplakia, oral submucous fibrosis (OSMF), oral lichen planus (OLP), oral cancer, MMP-9, gelatinase B, 92K Da gelatinase, 92 K Da Type IV collagenase. A total of 35 articles were identified, in which 5 article was obtained by hand searching. Articles in English language which reported checking of the MMP-9 levels in tissue, saliva or serum samples of OPMD during 2005-2015 were included in the study. Animal studies were excluded. The studies done only in oral cancer excluding the OPMDs were excluded. The studies done in cancers other than oral cancer were excluded from the study. Applying these inclusion and the exclusion criteria, 32 articles were excluded as one of them was a study on animals, one of them was in Russian language, one article was not done with in the time period of the included study and the rest of the twenty nine were either done in a different MMP or in a different cancer or only in oral cancer and not in OPMDs [Figure 1]. A total of eight studies were obtained which were assessed by QUADAS,  quality assessment tool for risk of bias and acceptability concern. 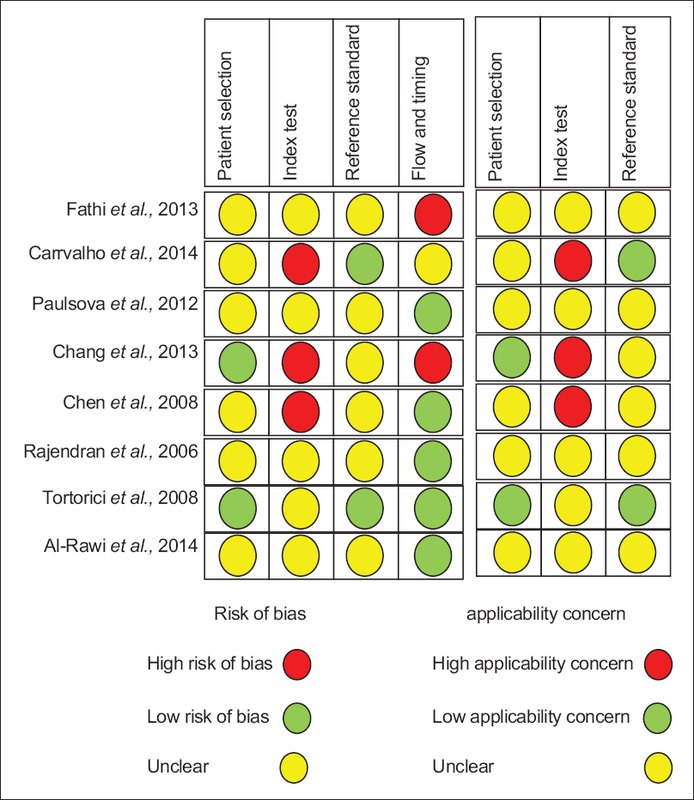 Data were collected using a table having all the characteristics of the included study [Table 1]. These studies were done on 182 oral squamous cell carcinoma (OSCC) cases, 430 OPMDs (146 OLP, 264 leukoplakia and 20 OSMF) and 352 controls evaluated for MMP9 [Figure 2]. In all the studies except one study,  MMP-9 expression has been statistically proved to be elevated in OPMDs than in healthy controls. Moreover, MMP-9 expression in OPMDs was decreased than in OSCC. The study in the saliva states MMP-9 to have a sensitivity of 35.3% and specificity of 100%. The study in serum states sensitivity of 67.4% and specificity of 90%. Whereas, the studies in tissues have not given any sensitivity or specificity of MMP-9 or the cutoff value to clearly identify the condition. MMPs occur in human samples, which can be evaluated by immunohistochemistry, enzyme-linked immunosorbent assays (ELISA), zymography and real-time polymerizing chain reaction. Immunohistochemistry is the most commonly used methodology in tissue samples, ,,,,, which has not quantified the MMP-9 levels, it also cannot differentiate between the latent and active forms of MMP. 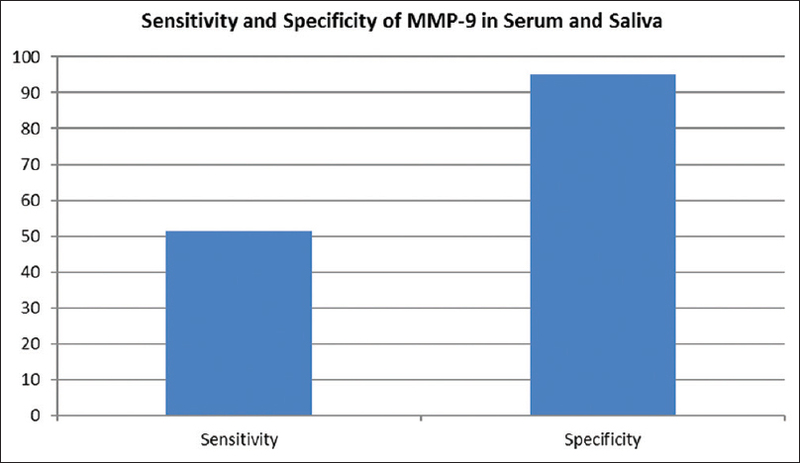 In serum sample, only a single study has been done in which MMP-9 is quantified by ELISA,  which is sensitive but expensive. Gelatin zymography is cost-effective, can be reproduced and can differentiate between latent and active form of the enzyme. In the saliva samples, the method used is real-time reverse transcriptase polymerizing chain reaction to detect the genetic expression of mRNA of MMP-9,  which makes the technique more sensitive. Tissue inhibitors or TIMPs inhibit the action of MMPs. The imbalance between the MMPs and the TIMPs is one of the reasons for progression of malignancy. Of the eight studies, three studies ,, done on tissue samples have compared MMP-9 with TIMPs. Two studies have seen them in OLP and one has done in OSMF. One study on submucous fibrosis states that TIMP-1 does not give a statistically significant result while TIMP-2 does. One of the studies does not mention about the relationship of MMP-9 to TIMPs. While the other study says that TIMP-1 and TIMP-2 are expressed more strongly than in the OSCC, no relation was found with the level of MMP-9. MMP-9 is inhibited by all the four TIMPs (TIMP-1, TIMP-2, TIMP-3 and TIMP-4). Only TIMP-1 and TIMP-2 have been estimated in three of the above studies and the remaining two TIMPs (TIMP-3 and TIMP-4) have not been evaluated. There are synthetic TIMPs and also TIMPs specific to MMPs being developed,  which can be used in intervention of malignancies. One study done in saliva samples (AUC-0.647)  [Table 2] and another done in serum samples (AUC-0.806)  [Table 3] have mentioned the sensitivity, specificity [Figure 3] and receiver operating characteristic (ROC) for MMP-9 [Figure 4] and other markers in them, the remaining six studies ,,,,, [Table 4] being diagnostic tests, have not mentioned the sensitivity, specificity and ROC. Index test and cutoff value for the marker have been calculated before the study only in one study done in saliva samples. However, the major shortcomings of these two studies , is that the clinical diagnosis of OLP and oral leukoplakia is not confirmed by tissue biopsy. From these studies, the levels of MMP-9 in potentially malignant disorder shows elevation in the eight studies when compared to healthy control samples, but decreased levels than OSCC. ,, The studies were heterogenous and were done on different samples such as tissue serum and saliva. The expression of MMP-9 is in different scale of measurements in different studies. Hence, there is a need for homogenous studies with tissue, saliva and serum sample of same patient and longer follow-up periods. Six of the studies have been done in the tissue samples of OPMDs; there is only one study in serum and one study in noninvasive diagnostic tool such as saliva. Due to the technical difficulty in handling saliva and storing it without the degradation of the content, minimally invasive serum samples would be better in evaluating the MMP-9 and quantifying its expression in oral potentially malignant disorders such as oral leukoplakia, OLP and OSMF. Gialeli C, Theocharis AD, Karamanos NK. Roles of matrix metalloproteinases in cancer progression and their pharmacological targeting. FEBS J 2011;278:16-27. Patel BP, Shah SV, Shukla SN, Shah PM, Patel PS. Clinical significance of MMP-2 and MMP-9 in patients with oral cancer. Head Neck 2007;29:564-72. Lotfi A, Mohammadi G, Tavassoli A, Mousaviagdas M, Chavoshi H, Saniee L. Serum levels of MMP9 and MMP2 in patients with oral squamous cell carcinoma. Asian Pac J Cancer Prev 2015;16:1327-30. Shpitzer T, Hamzany Y, Bahar G, Feinmesser R, Savulescu D, Borovoi I, et al. Salivary analysis of oral cancer biomarkers. Br J Cancer 2009;101:1194-8. George A, Sreenivasan BS, Sunil S, Varghese SS, Thomas J, Devi G, et al. Potentially malignant disorders of oral cavity. J Oral Maxillofac Pathol 2011;2:95-100. Paulusová V, Laco J, Drízhal I, Slezák R. Expression of matrix metalloproteinase 9 in patients with oral lichen planus. Acta Medica (Hradec Kralove) 2012;55:23-6. Fathi MS, El Dessouky HF, Breni HA. 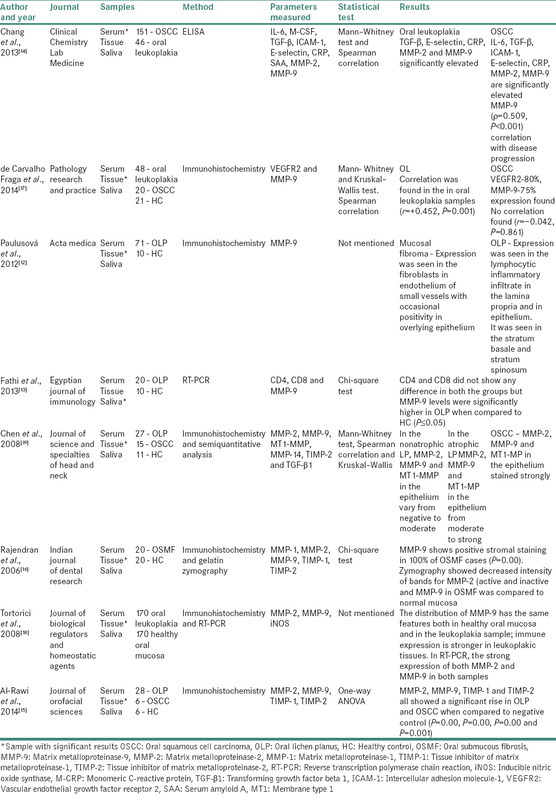 CD4+CD25+T regulatory cells and MMP-9 as diagnostic salivary biomarkers in oral lichen planus. Egypt J Immunol 2013;20:39-53. Chang PY, Kuo YB, Wu TL, Liao CT, Sun YC, Yen TC, et al. Association and prognostic value of serum inflammation markers in patients with leukoplakia and oral cavity cancer. Clin Chem Lab Med 2013;51:1291-300. Al-Rawi N, Majeed A, Al-Kassam T. Expression of matrix metalloproteinase-2 and 9 with their inhibitors, tissue inhibitors of metalloproteinase-1 and 2 in oral lichen planus. J Orofac Sci 2014;6:25. Rajendran R, Rajeesh MP, Shaikh SS, Pillai MR. Expression of matrix metalloproteinases (MMP-1, MMP-2 and MMP-9) and their inhibitors (TIMP-1 and TIMP-2) in oral submucous fibrosis. Indian J Dent Res 2006;17:161-6.
de Carvalho Fraga CA, Farias LC, de Oliveira MV, Domingos PL, Pereira CS, Silva TF, et al. Increased VEGFR2 and MMP9 protein levels are associated with epithelial dysplasia grading. Pathol Res Pract 2014;210:959-64. Tortorici S, Mauro A, Burruano F, Difalco P, Leone A, Gerbino A, et al. Matrix metalloproteinase-2 matrix metalloproteinase-9 and inducible nitric oxide synthase in oral leukoplakia: Immunohistochemistry and RT-PCR analysis. J Biol Regul Homeost Agents 2008;22:125-30. Chen Y, Zhang W, Geng N, Tian K, Jack Windsor L. MMPs, TIMP-2, and TGF-beta1 in the cancerization of oral lichen planus. Head Neck 2008;30:1237-45. Fluctuating Roles of Matrix Metalloproteinase-9 in Oral Squamous Cell Carcinoma. Available from: http://www.hindawi.com/journals/tswj/2013/920595/. [Last accessed on 2016 Jul 03].